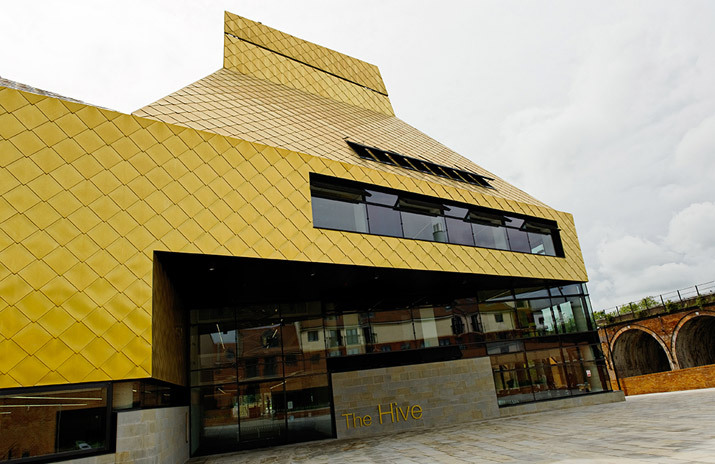 On 11th July 2012, the Hive was officially opened by Her Majesty the Queen. The Hive is the outcome of the vision and commitment of two key partners; the University of Worcester and Worcestershire County Council. Having the great ambition of creating a joint library, definitely the first of its kind and was girdled with the set of core values that still form the backbone of what ‘The Hive’ is today. These values are: Inspiration, Connection, Aspiration, Learning, Integration, Inclusivity, Enduring Values, Well-being, Sustainability and Visibility. Its location emphasises the tangible link between the University and the town centre; forging a strong working relationship between Council and University. With much thought and consideration over the sustainability of the building, and in keeping with contemporary necessity for environmental friendliness, with plent of natural light and a ‘natural ventilation strategy’, the design has adopted the use of sustainable materials that will endure. In addition, a key element of the original design brief was that 50% of the building’s energy would come from renewable sources. This entry was posted in Libraries and tagged Creativity, ecology, joint-use, Libraries, Library Design, Sustainability. Bookmark the permalink.